Grandaisy Bakery specializes in making authentic, delicious Roman-style pizza in the Tribeca neighborhood of New York City. Our Roman-style pizzas are popular for a quick bite as well as perfect for events and catering. Move over Neapolitan pizza - we’re here to tell you about your new favorite Italian flatbread. Roman-style pizza is flatbread that’s not necessarily made with the familiar mozzarella and tomato sauce. We put our delicious vegetable toppings directly onto thin focaccia dough, and only use cheese in a supporting role to enhance flavor and saltiness. This authentically Italian treat is served cut into squares, or “al taglio” (literally, by the cut). 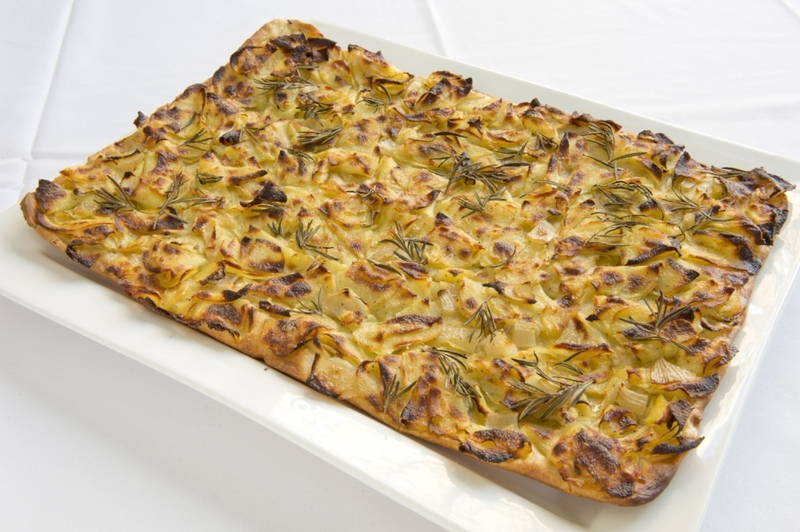 Each delicious slice is delicately dressed with simple ingredients in heavenly combinations, like cauliflower and gruyere or potatoes and rosemary. See our the staff tally for their favorite Roman-style pizza! There may be some clear winners, but everyone has their own Focaccia alla Romana that’s the best in their eyes. You’ll just have to try them all! You can find all of these, and even some seasonal specialties, at our retail location in Tribeca. We also offer catering and delivery in Manhattan. Click to view our catering menu.